EPISODE 1, SEASON 1- "PILOT"
I love "Minority Report," its such a great movie. That's right, I said it, "Minority Report" is a great movie. Of all the great movies that came out in the 2000's, somehow "Minority Report" gets swept under the rug and forgotten about. Funny, because I don't understand how some people remember "War of the Worlds" by Steven Spielberg, but not "Minority Report" by Steven Spielberg. I am always a sucker for a great crime mystery, and I am always a sucker for a good science fiction movie. Spielberg is a master of the latter, but the way he blended the former was absolutely captivating and instantly underrated. Its a movie I will enjoy forever and I feel no shame over it. That doesn't necessarily mean I wanted a television series based on the movie. Especially a movie that takes place after the movie, but in the same timeline. I felt the movie ended as perfect as it could get, I still wish Spielberg didn't cut the final line Tom Cruise's voice-over had, which would have lead to some fun debate after leaving the theater, but that's okay. For what it was, it ended beautifully, how could a television show do that justice? How could they successfully continue a story that ended so well? Well, that notion at least had my attention. This show takes place years after the movie left off. The Precogs, three sibling psychics who helped the Washington D.C. stop murders before they happen, have been living in solitude for many years. Now, they all have stomped off the cabin, and they are doing their own things. The Precog we follow on the show is Dash (Stark Sands), who has basically become a costume-less superhero. Literally. He has returned to our nation's capital to stop murders once more, all by himself. This grabs the attention of Detective Lara Vega (Meagan Good), who recognizes who Dash is and hopes for his cooperation in finding murderers and stopping killings before they happen. So far, that seems to be all you need to know. I could be wrong, and perhaps I am, but that is all you need to know. 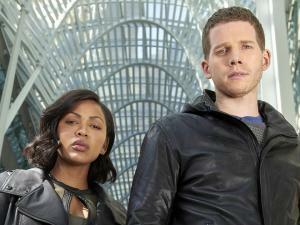 "Minority Report" looks as if its going to be just another cop show, only this one is set in the future and features a psychic. But other than that, it looks like just another cop show. I know that's an awful lot to pin on a show based on one episode. But it had the same formula as other cop and detective shows. Once Vega and Dash hook up, the rest of the show is them solving a murder and stopping it before it happens, just like every other cop show. I hope the show plans to implement some things to make unlike other shows in the herd, but that may not be. One thing that was instantly distracting was all the throwbacks to the movie, all crammed in the show's pilot. If you haven't seen "Minority Report" the movie, then I am sure you won't worry about what i am saying. But those of you who have seen it will be instantly distracted. There is so much "HEY REMEMBER THIS FROM THE MOVIE" and "HEY REMEMBER THAT FROM THE MOVIE??" that it instantly becomes annoying. The show also does that thing where you think you'll see another movie reference, but they tweak it a bit. In the movie, the police used mini, bug-like robots called Spiders. The Spiders read your eyes in order to confirm your identity. In the tv show, Vega uses a version of Spiders called "Lenses," instead of crawling, mini-robots, they are flying mini-robots. But they do the exact same thing, to the exact similar music. I find it distracting when a show or a something-or-another goes out of its way to force the audience to remember the source material. This show is overly guilty of it so far. Does the show have potential? Well, kind of. They are setting up a subplot involving Dash's other siblings; Arthur (Nick Zano) and Agatha (Laura Regan). Aparently Dash helping this detective will eventually put all the Precogs into harm, this could be interesting. I hope it works out and turns into something cool. That little piece will keep me watching. I hope the show tries to add a little more to the show to separate itself from the other cop shows, because I don't know if putting an ordinary cop show into a science fiction setting is the right move. I liked seeing Daniel London, who played Wally in the movie, show up and I hope there is more to his presence than just a quick cameo. There are some pockets of potential here and there, and I hope that pans out. Right now, it feels like "Minority Report" is just another cop show.